Sad it was time to leave our new favorite village, we returned to the car and drove the mile's drive to meet the owner of the next villa, Villa BRV FED. The owner also runs a highly regarded restaurant and hotel in the village. Upon meeting the smiling Nila, we followed her down the road a little bit more to the driveway for BRV FED. The villa is located directly across the street from the famous Fonteverde Spa. (Guests of the villa enjoy discounts at the spa!) After parking the car in the shade, we got out and could immediately hear the rushing water from the spa which runs under the approach road to the villa and is very peaceful. BRV FED is a 7 bd/7ba newly built villa located about a 3 minutes drive from the village and has 360 degrees of views. 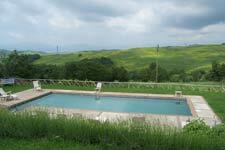 It is situated on a bluff with the stunning hills stretched out before you along with a view up to the village. Nila, welling with pride (as she should be) toured us through her impeccable home. When we reached the kitchen's herb garden a.k.a. giardino della guerra (garden of the war) we were treated to a heavenly scentfest. Nila kept giving us fresh herbs to smell. The kitchen itself is a chef's dream, equipped with every gadget or you could hire Nila to prepare a meal for you (she is also the chef at her restaurant and I can tell you she is a PHENOMENAL chef). All of the guestrooms are equipped with hotel like amenities and have hillside views from all of the windows. Suzanne and I immediately thought it was perfect for many of WIMCO's clients. It is so comfortable and elegant. After thanking Nila for her time and congratulating her on her beautiful home, she invited us to dinner that night at her restaurant. Eager to spend as much time as we could in the village, we accepted the kind offer. It was almost lunch time and we were not sure we were going to have enough time for lunch later in the day, so when Suzanne and I looked at each other we knew what our next step was- back to the village to find something to tide us over, plus we had an excuse, that was where we were meeting our next villa contact- where else? Bar Centrale. We each enjoyed a cone of gelato and sat on the wall once again, awestruck by the view. Also there this time, was the fish market. The market comes to the piazza once a week in the form of a van. They park and open up one side and display their goods and the villagers descend on them. We did not stick around, but based on the crowd, I am pretty sure they sell out of everything. 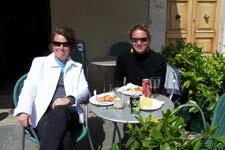 We met with Antonietta and her son and followed them to Villa BRV SOL. Driving past BRV FED and up into the woods, about 5 minutes from the village we arrived at villa BRV SOL. At this point, I did not think it was possible to be more in love with a village and its views but it happened. Villa BRV SOL is located higher than BRV FED and the views are even more dramatic. Included in this view is Mt. Amiata in the distance. I immediately pictured my stepfather here with his group of friends sitting around the gardens spending the days painting and trying to recreate this view. Sadly, the views are so stunning I do not think they can be replicated by any painter. BRV SOL is a 7 bd/6 ba home decorated with a sort of comfortable rustic elegance. 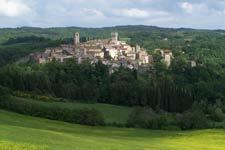 This village has so much to offer it's guests – the spa, the views, the quaint shops, the proximity to villages like Pienza (for the cheeses and the restaurant Latte di Luna overlooking the hills), Montalcino (for the wine), Arezzo (for the monthly antiques market), Cortona and Siena for day trips or one could simply spend the day relaxing by the pool enjoying a good book. Like Siena, San Casciano dei Bagni has a Palio in April. Dinner that night at Nila's restaurant was the first WOW meal of our two week trip touring WIMCO's Italian villas. I vowed to return to San Casciano dei Bagni as soon as possible and to redecorate my house immediately.